Hi all! I'm Jen's twin Becca. 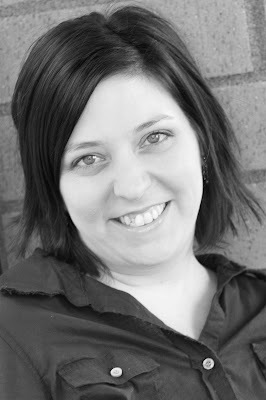 Jen has graciously signed me on as a guest designer and occasional writer for her fabulous blog. What a privilege! I guess it is pay back for introducing her to the big wide world of scrapbooking! We are now even. My first love in papercrafting is scrapbooking. I love to tell stories with my pictures. Regular photo albums are boring! Scrapbooking brings life to a memory and is a way to share that story with others. In the past couple of years, I have started to dabble into card making - mostly because I love to make packages of cards as gifts. Receiving a greeting card in the mail can be such a surprise among the pile of ads, credit card applications, and stacks of bills that are usually delivered daily! In this day and age when our lives are full of emails, texting, instant messages, and voicemails - nothing is more touching then receiving a card in my mail box…and well, if it's handmade, the sender gets extra brownie points! Yes, I love it when I get birthday and holiday cards, but what about a "happy un-birthday" card (catch the Alice & Wonderland reference)? 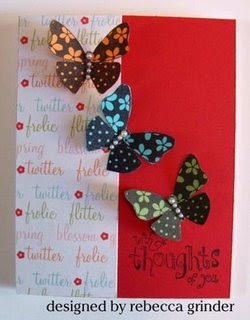 The best cards, are cards delivered for no particular reason but for the purpose of a random acts of kindness. Those make my day! To save time during my card making process, after scrapbooking a layout, I'll paperclip my scraps together and set them aside in a "card making scrap box". 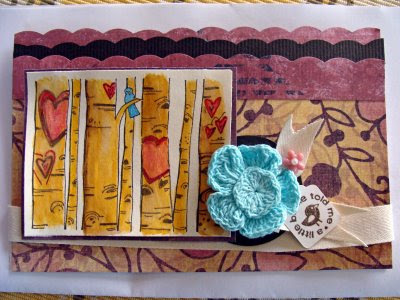 Then, when I find a few minutes to work on a card, I'll pull out my box and have the matching papers readily available. Here are some images of my recent cards and I hope they will jump start your creative juices to create some absolutely lovely cards! Supplies: Paper - Poptones Text Paper, Imaginese, Bazzill Smoothie CS. Stamps - Making Memories BF & Inkadinkado sentiment. Embellishments - Pearls Michael's Crafts Stores. 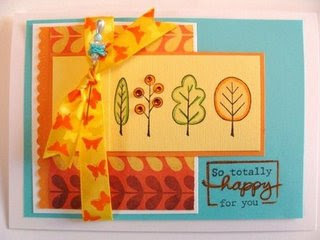 See some more of Becca's designs at One Bright Spot. Create Well: Find time this week to actually send some of those cards you make to drop a note in the mail as a random act of kindness. You'll put a smile on someone's face!